Port wine stain (PWS) is a congenital vascular malformation with an unknown pathogenesis characterized by progressive ectasia of dermal capillaries. Port wine stain (PWS) and juvenile localized scleroderma are two different dermatoses usually encountered in pediatric age group. 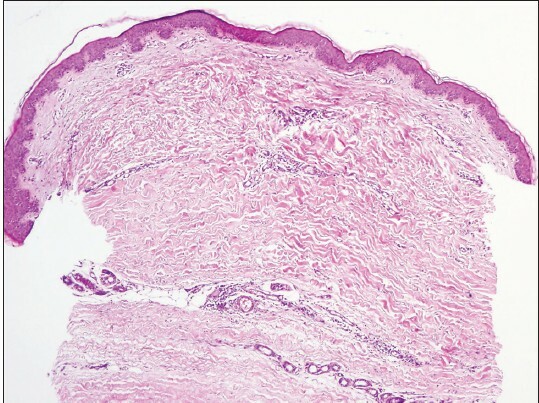 Juvenile scleroderma is a fibrosing disease of unknown pathogenesis, characterized with increased collagen deposition, and may result with permanent deformities. PWS is a congenital capillary malformation with pink to purplish telangiectatic macules. Lesions are usually present at birth and persistent. We herein present a case of juvenile localized scleroderma on the left side of trunk, with congenital PWS located on ipsilateral face at V1-V2 distribution. This coexistence has not been reported previously. A 21-year-old female patient was attended to our clinic for lesions which have started on anterior aspect of the left thigh 10 years before and new ones which have recently appeared on the left forearm and the lateral aspect of the left breast. The patient received various topical treatments, narrow-band UVB, hydroxychloroquine and dapsone previously with a diagnosis of morphea. She did not receive any treatment for 6 months and the breast lesions occurred during this time. On dermatological examination, erythematous-brown firm plaques on the anterior aspect of the left thigh, left forearm, medial aspect of the upper arm and lateral aspect of the left breast were observed [Figure 1]a and b. Furthermore she had congenital dark red telangiectatic macular plaques localized in ipsilateral V1 and V2 distribution on the face [Figure 2]. The punch biopsy from the new plaque on the breast was compatible with localized scleroderma [Figure 3], with dermal perivascular lymphomononuclear infiltration and focal sclerosis in subkutis and deep dermis. The lesion located on the face diagnosed as a PWS. Ophthalmologic and neurological examinations were normal. There was also no pathology in cranial computerized tomography scan and magnetic resonance imaging. On laboratory examination, complete blood count, urinalysis, renal and liver function tests were within the normal range and antinuclear antibodies (ANA) were positive at 1/400 titer. Further autoimmune panel were negative. Methotrexate treatment (15 mg/week) was started for progressive disease and she is still on follow ups. Vasculopathy and loss of sympathic innervation should be emphasized as mechanisms that may explain the coexistence of both diseases. Nail capillary structural anomalies and vasospastic changes in Raynaud's phenomenon give rise to a consideration that there are anomalies at vascular level in the pathogenesis of scleroderma. Complex neurohumoral mechanisms have a role in these vascular changes. A nerve conduction study among the patients with morphea and scleroderma revealed deceleration in the nerve conduction pointing autonomic nerve system impairment. On the other hand studies on pathogenesis of PWS, did not show any deformity in the vessel wall. But, embryological developmental defects in sympathetic innervation lead to changes in vascular tonus which may be responsible for formation of PWS. Perivascular innervation in lesional skin is shown to decrease in the studies. , Besides, chromosome 5q allele responsible for neurogenesis is linked to multiple PWS cases, in genetic studies. Mosaic genetic changes at this locus, with the aid of various triggers, may initiate the pathogenetic reaction chains. Of course this is just a hypothesis and coincidental existence of both diseases is also possible. In fact, genes related to scleroderma are still not well known despite the advanced technologies. There are cases which are evaluated as acquired PWS and proved to be morpheic lesions on their follow up. 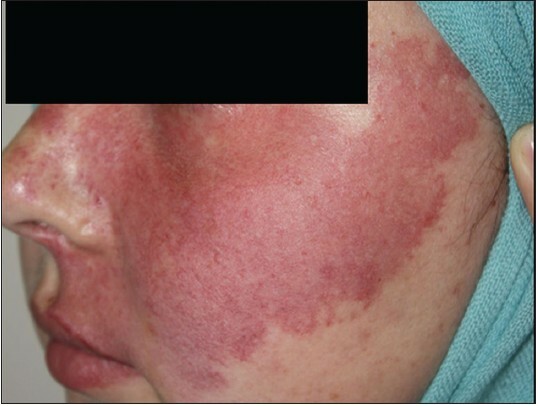 In addition, there are cases recognized to be morphea after treatment with pulsed dye laser or intense pulsed light therapy for treatment of PWS. After a search in the literature, we found no case reporting the coexistence of morphea and PWS. As vasculopathy and disturbance of innervation play important role in pathogenesis of both diseases, and the lesions are located ipsilaterally; the diseases are thought to be somehow related. But, further studies are required. Vancheeswaran R, Black CM, David J, Hasson N, Harper J, Atherton D, et al. Childhood-onset scleroderma: Is it different from adult-onset disease. Arthritis Rheum 1996;39:1041-9. Zancanaro PC, Isaac AR, Garcia LT, Costa IM. Localized scleroderma in children: Clinical, diagnostic and therapeutic aspects. An Bras Dermatol 2009;84:161-72. Ch'ng S, Tan ST. Facial port-wine stains-clinical stratification and risks of neuro-ocular involvement. J Plast Reconstr Aesthet Surg 2008;61:889-93. Rosen S, Smoller BR. Port-wine stains: A new hypothesis. J Am Acad Dermatol 1987;17:164-6. Fonseca C, Abraham D, Ponticos M. Neuronal regulators and vascular dysfunction in Raynaud's phenomenon and systemic sclerosis. Curr Vasc Pharmacol2009;7:34-9. Raszewa M, Hausmanowa-Petrusewicz I, B³aszczyk M, Jab³oñska S. Sympathetic skin response in scleroderma. Electromyogr Clin Neurophysiol 1991;31:467-72. Katagampola GA, Lanigan SW, Rees AM. Normal distribution of endothelin in port wine stain vasculature. Br J Dermatol 1997;137:323-4. Piaserico S, Belloni Fortina A. Posttraumatic port-wine stain in a 4-year-old girl: Fegeler Syndrome. Pediatr Dermatol 2004;21:131-3. Breugem CC, Alders M, Salieb-Beugelaar GB, Mannens MM, Van der Horst CM, Hennekam RC. A locus for hereditary capillary malformations mapped on chromosome 5q. Hum Genet 2002;110:343-7. Pickert AJ, Carpentieri D, Price H, Hansen RC. Early morphea mimicking acquired port-wine stain. Pediatr Dermatol 2014;31(5):591-4. Epub 2013 Apr 29.